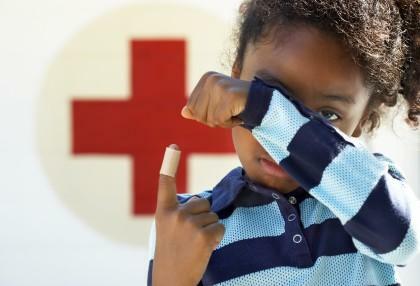 Burns are a common domestic hazard that if not avoided properly can befall both adults and children, so the knowledge of how to treat burns is a 'must have' piece of first-aid information in the unfortunate event that a burn is sustained. Burns are sustained when the skin comes into contact with dry heat, and scalds are sustained when contact is had with a liquid of vapor. Both can cause varying degrees of damage to skin and treatment varies dependent on the severity of harm. Sunburn in some cases can be severe enough to require treatment both to the skin and for the symptoms of shock. As with other types of burn it is essential to know when medical treatment may be necessary. What caused the burn - for example was it steam, hot liquid or contact with an open flame. How large is the surface area covered - such as a finger tip, or an entire limb. How deep has the skin been burnt - for burns or scalds caused by brief contact with the item, very minor damage may occur; however, lengthier contact such as being immersed in a hot liquid or falling onto something hot may cause much deeper skin damage. Is the airway affected - due to the extent of some burns, if the throat and/or airway are affected then respiratory function may be compromised; it is important to assess immediately if likely airway damage has occurred. Once an assessment has been made the appropriate level of first aid can be administered in the case of minor, superficial burns. However, in cases of severe burns or scalding it is crucial to call 911. Unless medically trained, nobody is expected to be an expert on how to treat burns and scalds however there are some universal first-aid maneuvers that can indeed potentially reduce the overall harm of the injury. Firstly it is essential to remove yourself or the person who has been burnt or scalded from the source of the heat. If the burn has been caused by a naked flame, for example, then move safely away from the danger point. If a person has been scalded by hot liquid, then leave the site where the liquid has been spilt or touched. For minor domestic burns or scalds, such as brief contact with a hot item, surface, liquid or vapor, immerse the affected area in cool water (not ice-cold) for approximately 10 minutes. For larger surface areas, such as burns to the torso, immerse the entire body in a bath of cool water for the same amount of time and preferably no longer. Otherwise, problems such as hypothermia can be a secondary hazard if the body then gets too cold. If a hand is affected, it is always advisable to remove jewelery, especially rings, as in some cases the fingers or hands can swell. This makes it difficult to remove items at a later time. Where a burn or scald has occurred on an area of skin covered by clothes, remove the garment if possible. In cases of severe burns it is not advisable to do this as some fabrics adhere to the skin and can cause greater trauma if removed. After removing clothing and cooling under water, apply a damp tea cloth or similar item to ensure the area is kept moist. If transporting to a hospital for further treatment, cover the affected area with kitchen cling wrap or a clean polythene bag if possible. Not only does this keep the area clean, but retains some of the moisture also. Never immerse the wound in ice-cold water - this can cause hypothermia in cases of larger burns due to fluid loss from the injured area. Do not apply creams, ointments or dressings to serious burns - some medical creams and ointments can be corrosive to the skin when it has been burnt. Where something may be useful on cuts and grazes, burn injures require very different treatment. Dressings, too, can stick to the affected area and dry out very quickly, causing further skin loss when removed. Never burst blisters that are caused by burns or scalds - this can provoke further fluid loss than is necessary and then make the skin more prone to infection. Often burns are superficial and easily treatable using basic first-aid maneuvers. In the event of uncertainty it is always best to seek medical help, and in particular in the case of severe burns or scalds it is vital to call 911 for help as soon as possible. If you call for help, basic treatment for the injury can be delivered in the time when waiting for help to arrive. Once you have learned how to treat burns, you will have acquired a skill which may be useful throughout life. Therefore, learning the correct way to treat burns could save a life.